A long time ago now, there was a book called Twilight and it was sort of controversial and people were talking about how much they either loved or hated it. As a long term fan of Young Adult supernatural romance I enjoyed the resurgence of interest in the whole genre. So…I wrote a game (I wrote a novel too but that’s a different project altogether), and it was the first game that I ever published. I have print copies in my house even! My game is fondly named after several different young adult supernatural romances and is designed to be a parody. The set up is more of a convention game or one off than a campaign, (Monsterhearts is better for a campaign). It rocks at conventions, me and my best friend Sophie sometimes run this game as a double feature with two groups in the same room playing interconnected games which is a really fun and raucous way to play. The Silver Kiss game is designed for four players and one facilitator. Two players play a pair of supernatural best friends and the other two play ordinary humans. Roles are set, so one of the supernaturals and one of the humans falls in love as soon as they see each other and then the game plays out with everyone dealing with the romance and their own secret agendas. I wanted to encourage silliness and fun so I added in an instant XP system, where if a player uses one of a pre-printed emo quotes in the game then they get a piece of candy. It works pretty well to get the players invested and energised. 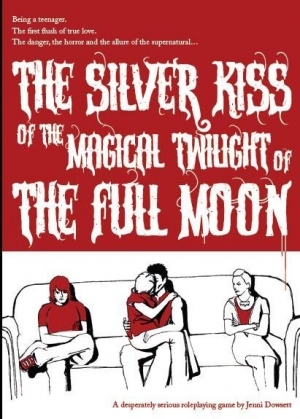 The Silver Kiss by Annette Curtis Klause which is a great book and in my opinion better than Twilight, she wrote a fantastic one about a girl werewolf, boy human relationship called Blood and Chocolate as well. Wicked Lovely by Melinda Marr is a great romance about how absolutely awful faeries can be, and how intoxicating. Generation Dead by Daniel Waters if you have trouble imagining zombies in love. Beautiful Creatures is an underrated piece of awesome about a witch girl and a human boy. Very Southern Gothic and pretty.